Sports tend to bring out the worst in us. While they provide a pleasant distraction from our daily lives, our passion for them can sometimes create ugliness. Look no further than the reaction seen from many Ohio State football fans in response to yesterday’s bombshell story regarding the alleged domestic abuse of Courtney Smith by her ex-husband, recently-fired wideout coach Zach Smith. The report took a new turn when it was revealed that, despite his denials, head coach Urban Meyer may have known about Smith’s abuse dating as far back as 2015, and did nothing. However, this is less about the ins and outs of this potential scandal, and more about how many Buckeye supporters reacted to it. To be blunt, it was a sickening display of the double standard we often see when a story like this impacts the organization we choose to support. We don’t yet know if the allegations are true. I’m not here to convince you otherwise. If they are, Meyer not only knew about the abuse Smith allegedly committed against his then-wife, he also didn’t address it and lied when asked about it. This could very well result in his firing. I can only assume the fear of this drove the disturbing reactions seen yesterday when the news broke. I can’t stomach sharing the responses. You can look for them yourself. You won’t have to search far, just peek at the replies to any tweets expressing concern about this story. 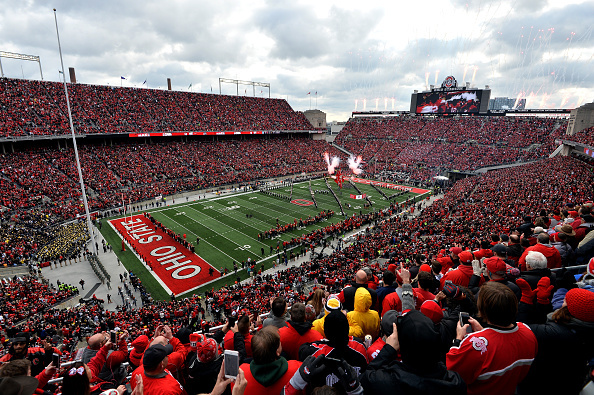 What you’ll find is the kind of denials Buckeye fans surely scoffed at when they heard them uttered by fans of Penn State or Baylor when those schools’ respective scandals broke out. Twitter was covered with reactions like this. Fans rushed to both defend Meyer and poke holes in the alleged victim’s story. While insisting we wait until all the facts come out, these people also quickly explained why the story was false or not a big deal. There’s a difference between “let’s wait and see how this story plays out” and rushing to immediately discredit the alleged victim, the reporter or the story itself. When you do this, you show your true bias. Your reaction is based less on the story and more on the anger you feel about it involving your school. Deny it all you want, it’s easy to see whose reaction to this story is littered with bias. It’s those who claimed McMurphy had an agenda against Ohio State. Who used the token “what took her so long to come forward” excuses typically lobbed at victims of domestic abuse. Who mocked the idea Meyer should’ve reported anything if he knew. Each of those reactions was tougher to read than the one before, especially people claiming it’s no big deal if Meyer knew and didn’t report anything. I’d like to think those who feel this way would have a different reaction if we were talking about one of their loved ones. Using the “legally he did nothing wrong” defense is equally upsetting. No, Meyer did not commit any act of abuse. However, if these reports are true, he did nothing when notified of it. Quote the law all you want, a man who touts morals such as “treat women with respect” reportedly looking the other way when told of potential domestic violence is reprehensible. I want to be clear – I’m not saying accept the story as gospel truth. The investigation is ongoing and not yet conclusive. At the same time, just as you can’t immediately determine Meyer’s guilt, you also can’t immediately bash the report and claim it’s false. The disturbing reactions don’t represent the entire Buckeye fan-base. What they do, though, is highlight the hypocrisy we so often see with a scandal like this. Simply put, fans are quick to cast judgement when it involves another team, and even quicker to jump on defense when it involves theirs. Concern for the alleged victims takes a backseat to fear of becoming a losing program. As a result, these fans resort to victim-shaming or shrugging off the lack of action. In this case, domestic abuse isn’t viewed as a crime, it’s just a rocky marriage that’s none of our business. These fans become jaded to the simple fact prioritizing victories over reporting a crime is unacceptable. This is the case for any school or team. Winning is not more important than the safety of someone suffering abuse. If the story proves true, and Meyer is fired as a result, the Buckeyes struggling next season will hardly be as concerning as someone being told of abuse and putting football before doing the right thing. The common response many fans used when asked how they reacted to similar scandals with other programs said all you needed to know. Yes it is. Those stories were about other schools. This one is about yours.